After Roth was, depending on who’s talking and what day it is, fired from or quit Van Halen following the world tour for their massive hit album ’1984,’ some people may have assumed that guitar pioneer Eddie Van Halen, his drummer-extraordinaire brother Alex, and bassist Michael Anthony would leave the singer in the dust creatively, particularly after hiring talented and charismatic solo star Sammy Hagar to take his place. The massive success of the new Van Halen’s ’5150? album, released four months prior, had to give even the unnaturally cocky Roth a moment of pause. Fact is, “Diamond” Dave had already assembled his own all-star rock band, featuring not just former Frank Zappa guitar whiz Steve Vai, but an equally dexterous and dynamic bass player, Billy Sheehan, as well as drum prodigy Gregg Bissonette. 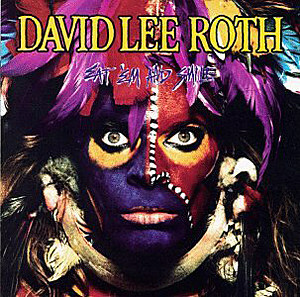 Clearly, Roth had decided not to deliver another pop-history nostalgia trip along the lines of his 1985 ‘Crazy from the Heat’ EP, which produced a pair of massive radio and MTV video hits with ‘California Girls’ and ‘Just A Gigolo,’ in addition to most likely accelerating his exit from Van Halen. First single and lead track ‘Yankee Rose’ finds Vai employing a trick even Eddie had never recorded before, literally talking with Roth via guitar as our hero dismisses the months of media gossip regarding the VH split (“Guess who’s back in circulation / Well, I don’t know what you may have heard…”) and focuses on admiring a woman walking down the street minding her own business. Another glove is thrown in the direction of his former bandmates later on, when Sheehan’s thunderous bass is introduced as a truly equal partner during the song’s instrumental climax. The spinning, dizzying, dual-fretboard gymnastics of ‘Shyboy,’ a hard-charging cover of a song from Sheehan’s former band Talas, solidify the band’s rock “bona fides” before they take a quick dip into retro-’Heat’ territory with ‘I’m Easy.’ Gratefully, this group can’t help but approach the material with a more aggressive bite then the all-star session players featured on Roth’s previous solo effort. Side one closes out with perhaps the most sophisticated, tasteful song Roth has ever recorded, the jazzy, smoldering and humorous late night travel journal ‘Ladies Night in Buffalo?,’ and then, arguably the album’s weakest track, second single ‘Goin’ Crazy,’ ironically dominated by Hagar’s former keyboard player Jesse Harms. The first four of the five tracks on side two are so well linked, sequenced and spaced that they could be nearly be considered Roth’s own ‘Abbey Road’ medley. First up is a turbo-charged take on the soulful rock standard ‘Tobacco Road,’ featuring a particularly strong and impassioned lead vocal performance, particularly for a guy who’s at least partially famous for forgetting the words to his biggest hits in concert.